We’ve added voice push notifications! In our commitment to continuous improvement we are delighted to add voice push notifications to both iOS and Android versions of ProControl+. You don’t have to do anything. This feature is available now; your users may have even already received them for events on their systems. “We’ve listened to market demands and this is a feature that was very much sought, so we are very pleased to implement this,” Laurence Kenny, Pyronix Marketing Manager, said. 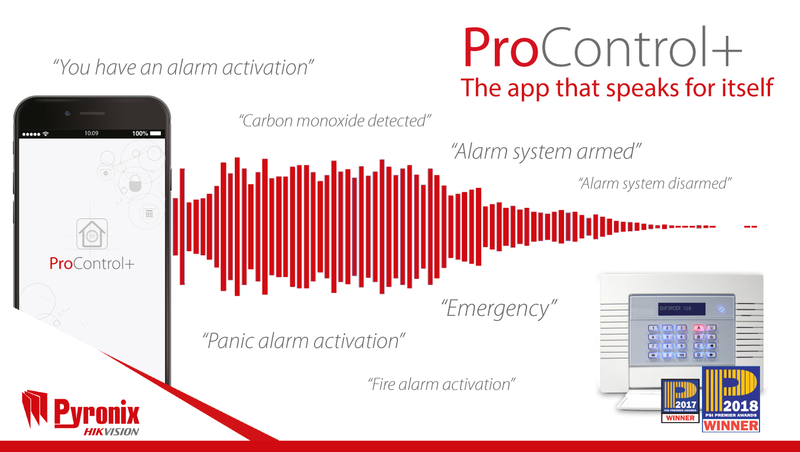 If there is an alarm, or when the system is set or unset, or an event is triggered by any Pyronix life safety devices integrated into the system, such as the SMOKE-WE, CO-WE or the HUD/MED-WE, the user will receive a voice push notification that will get their attention. “This feature adds value to ProControl+, without any additional cost or action required,” Laurence said. This feature, combined with our range of Full-HD Wi-Fi cameras for video verification, allows users to be told what is happening, see what is happening and take appropriate action. If your users do not receive push notifications currently and would like to now receive them with an audible voice, simply enable them in the PyronixCloud account. Pyronix, giving intrusion a voice.